Switzer Farm of Westport is the perfect setting for a wedding, or event of any kind on California’s North Coast — 35 minutes North of Mendocino in the historic village of Westport. 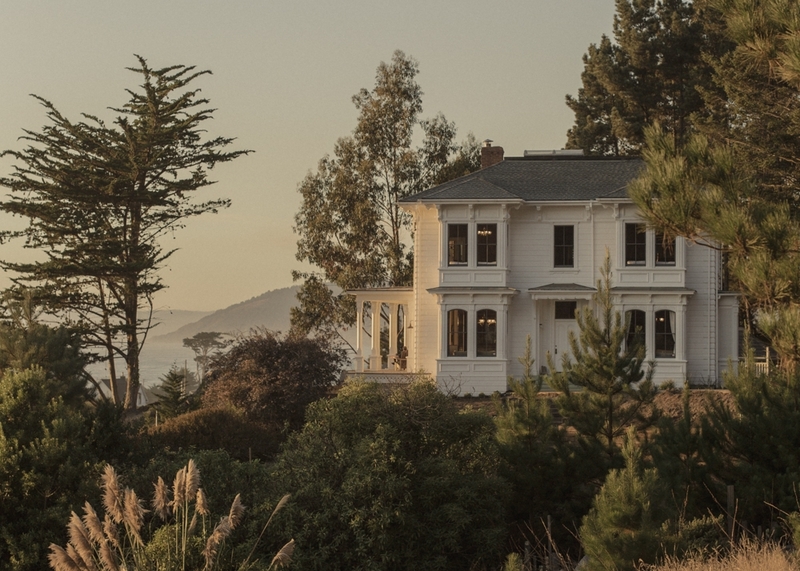 Perched at the very edge of the Pacific Ocean on California's North Coast, Switzer Farm is the perfect setting for a wedding, elopement, anniversary party, retreat, family reunion or event of any kind. 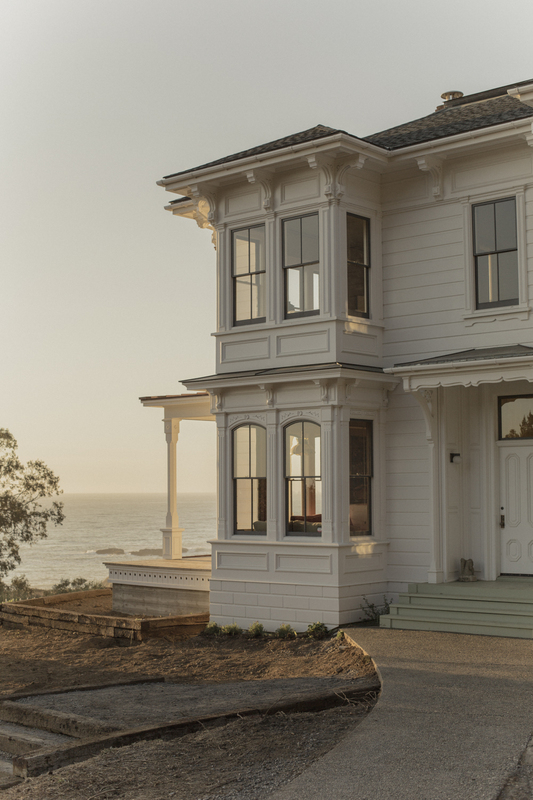 The restored 1884 Victorian home, garden cottage and two historic barns sit atop 22 oceanfront acres with 1/3 of a mile of private coastal bluffs. We enjoy an uninterrupted ocean view from everywhere on the site. We are located 35 minutes North of Mendocino, and 20 minutes North of Fort Bragg, in the historic village of Westport. The property is completely private. The farmhouse is situated hundreds of yards from our nearest neighbor, and is further cloistered by forests on all sides but the West (ocean-facing) side. And because the entire property is located West of Highway 1, there is nothing between you and the ocean but our very private pasture and coastal headlands. Throughout the property are wonderful outdoor spaces for your guests to gather and celebrate. The wild headlands and bluffs overlooking the ocean or our ocean-view veranda and West garden are all ideal settings for a ceremony or cocktail party -- or some afternoon whale watching. Our South lawn and the areas adjacent to our big barn provide perfect places for big dinners or dancing. All of these spaces enjoy majestic, sweeping views of the Pacific. The options are limitless. What is perhaps best about the farm site is that while it is completely private and secluded, it is also within a 5-10 minute walk of Westport. This means that those of your guests that are not staying with you on the Switzer Farm property itself can stay nearby in any of the 3 Westport B&B's or one of the many Westport Airbnb/VRBO rental homes. Not only does this obviate the need for any of your guests to drive to and from your wedding weekend events, but it underscores the intimacy of the weekend. All of your guests will have traveled to celebrate with you in this beautiful place -- far away from the rest of the world but close to you and to one another. The farmhouse comfortably sleeps 20+ people. There are 7 beautiful bedrooms, 4 with ocean views and 3 with views of the forested mountains to the East. Two of the bedrooms have both a queen bed and a queen sofa bed. The ocean-facing living room and library are equipped with queen size sofa beds. Finally, the finished attic is equipped with 2 queen self-inflating air mattresses. 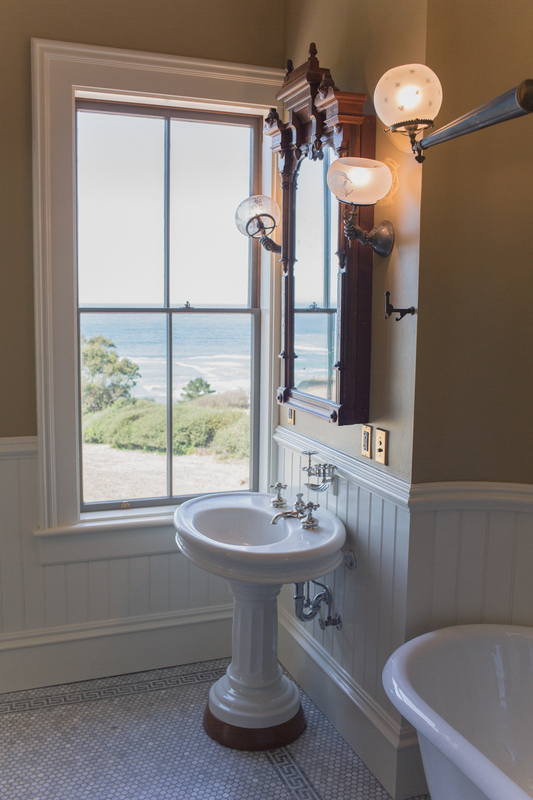 There are four full bathrooms, two with ocean views, all outfitted with restored turn-of the-century bath fixtures and fittings. Three of the four bathrooms have both showers and claw foot tubs, and the fourth has a shower stall. The home’s public rooms — living room, library, dining room and kitchen — all enjoy sweeping views of the ocean, meadows and headlands. The living room, library and dining room all have original decorative fireplace mantels. The gourmet kitchen has top of the line appliances and an adjoining laundry and pantry. While it has been restored to look as it did originally when it was part of a working sheep ranch and vegetable and dairy farm, it operates as a true chef's kitchen. The dining tables in the dining room and kitchen will seat 20 people comfortably. To top it off, there is a beautiful west-facing veranda overlooking the ocean, garden and headlands below. This space is perfect for morning coffee or a sunset dinner or cocktail party. The garden cottage, situated just off our South lawn, will sleep an additional 2 people and has a bathroom with a shower. It too enjoys sweeping ocean views and has an ocean-facing veranda. This is the perfect place to get far away from city life and enjoy time cloistered with family and friends, hiking, beach combing, stargazing, or whale-watching from the veranda and expansive grounds and promontories. This Northern California coast site has all the nature and natural beauty you could hope to experience. Each evening, the deer come out from our forest to graze in the ocean-front meadow below. We have a family of foxes that visit each night. We spot a whale — or many whales — most days we are here. Coyotes, quails, hawks, turkey vultures and barn owls pass through most days and nights as well. We spot the occasional mountain lion on our property from time to time. The sounds of the crashing surf ease us to sleep each evening and greet the new day as we awake each morning. This is our forever home, and we welcome you to enjoy it as much as we do. Michiko and Gary, and their 3 kids, Maia, Natasha and Kenzo, are the proud owners of Switzer Farm of Westport. Now that the kids are grown up, Michiko and Gary split their time between San Francisco and Westport. The family loves the Mendocino coast in general, and Westport in particular. Gary is passionate about Victorian architecture and design, and has been studying and collecting Victorian things since the early 1980s. In 2015, Gary quit his job of 32 years as a lawyer to take his dream job: restoring Switzer Farm to its original 1884 condition. Over the next 3 years, Gary took all the 19th century gas lights, plumbing fixtures and architectural elements he had been collecting for the past 30+ years (and storing in the family’s SF basement, attic and crawl spaces), and installed them here. It was a labor of love chronicled in his blog, SwitzerFeeFarm.tumblr.com. Now we hope you will love the fruits of that effort as we do. The coastal village of Westport is located 3.5 hours North of San Francisco. The drive includes stretches along Routes 128 and 1 that are among the most beautiful in the world. Westport is a scenic 35 minute drive North of Mendocino, and 20 minutes North of Fort Bragg. Westport is a very small village, but it has a lot to offer. There are several B&Bs, including the cozy and beautiful Westport Hotel and Abalone Pub. It serves dinners several nights each week, and afternoon tea on Saturdays. There are numerous Westport homes available for rent on AirBnB or VRBO. Just South of Westport is the luxurious and opulent Inn at Newport Ranch. Westport has a small country store that stocks essential supplies and has a gas pump as well. Westport also has a cute town beach located just a few steps from our property. Pacific Star Winery is just a 5 minute drive from Switzer Farm and offers ocean view wine tasting throughout the week. Fort Bragg has everything you will need to stock up for your stay. Harvest Market is a top-notch grocery store with excellent organic produce and meats. There is also a Safeway for the basics. We love Roundman’s for high quality butchered and smoked meats. There are terrific places for breakfast or coffee, including the Headlands Coffee House and Cucina Verona on Laurel Street and Cafe 1 on Main Street. North Coast Brewery makes some excellent beers, and has a tasting room right on North Main Street. Piaci's is a fun place for a wide variety of craft beers and pizza. There are world-class hiking and biking trails throughout the area. Usal Road to the Lost Coast is just 13 miles north of Westport. You can rent bicycles at Fort Bragg Cyclery on North Main Street. You can rent horses at Ricochet Ridge Ranch, just north of Fort Bragg, for half-day or all-day rides on the beaches and coastal trails. There are terrific beaches -- for surfing, tide pooling or just sunning -- all around us. Mendocino also has many great restaurants and shops, and is well worth a visit. It’s the only entire town that is registered on the National Register of Historic Places. Just an hour or so Southwest of Westport is the Anderson Valley, home to dozens of world class wineries, breweries and tasting rooms.